If you’re on a Western Caribbean cruise with a stop in Costa Maya, be sure to take a shore excursion to see the Mayan ruin site at Chacchoben! What an experience! With young kids (ages 3, 6 & 9), many adventure activities are not an option for us yet when traveling. The kids (or at least one or two of them) are often too small/too young/too short, etc. So, we’ve been seeking out things that everyone can participate in – and it’s a huge bonus when the activity is educational too! Learning about history and other cultures is one of the things I love most about traveling. 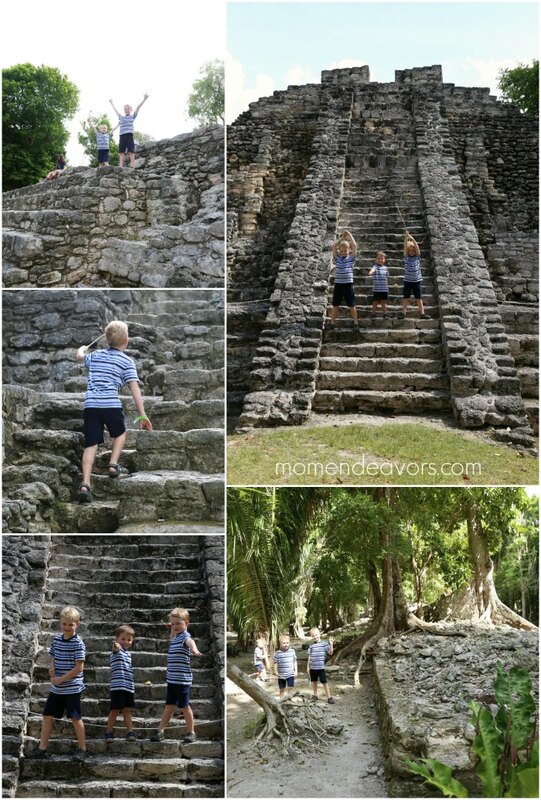 So, a visit to the Mayan ruins was absolutely PERFECT for our family! We felt like we were in an Indiana Jones movie (without any of the bad guys or craziness), walking around a lost city in the jungle. 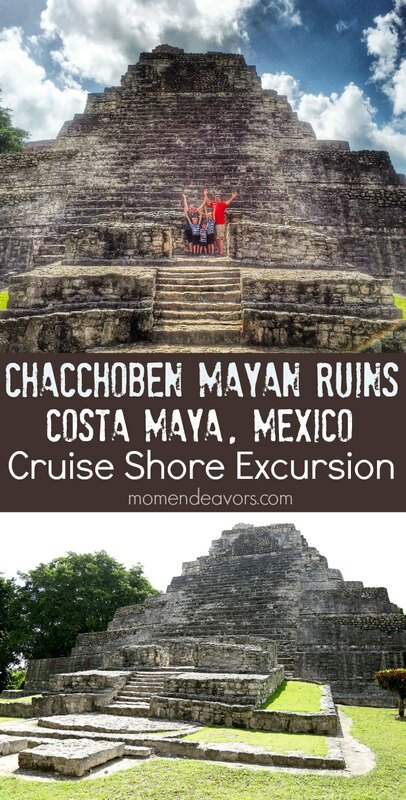 We were recently on the Carnival Magic and chose this Carnival-sponsored excursion for our trip in Costa Maya. After leaving the ship, the excursion started with about an hour long bus ride from the port terminal to the site. It was a very nice air-conditioned bus and they even gave us a paper sack full of snacks (a banana, bag of chips, granola bar, and cookie) plus a cold water bottle. Our guide, Sergio, shared all kinds of Mayan history and information about the site en route. He passed around all kinds of laminated maps, photos, and articles to help us visualize what he was talking about. Upon arrival then, we had about 2 hours to explore the site. 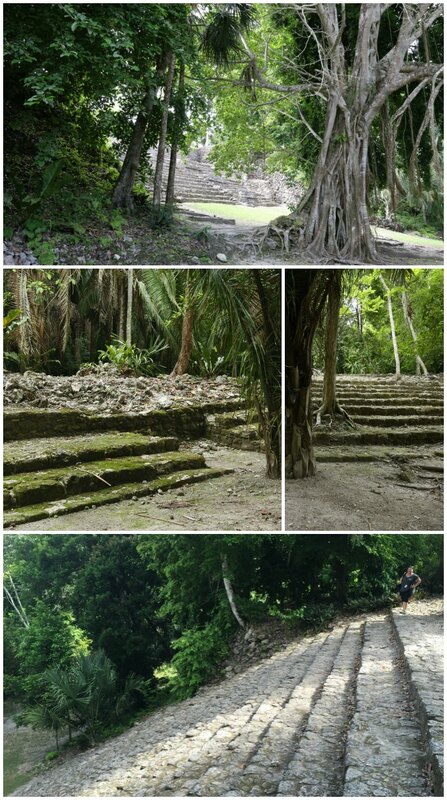 Sergio guided us around to different areas of what would have been like a small Mayan city. The structures they’ve excavated so far are incredible and date back to 200 B.C.!!! Amazing! We LOVED exploring here! You’re no longer allowed to walk to the top of the largest structures (to help preserve the site), but there was still plenty of climbing fun to be had, as well as lots of great photo opps! There was another big cruise ship in port that day and this is definitely one of the most popular shore excursions. So there were A LOT of people visiting, yet it didn’t feel too over-crowded or nuts. There was still ample opportunity to take photos, explore, and learn. As a history buff, I LOVED it! The kids did great with it as well. Even though the boys are still mostly too young to appreciate the incredible history here, it was pretty neat to watch them to integrate the whole area into their imaginative play by relating it to Star Wars. We overheard them having all kinds of Jedi temple conversations on the ruins. It was adorable! Once our time at the site was up, we were thrilled to board the lovely air-conditioned bus (so nice after hot, humid hiking). We then got back to the port terminal with about an hour or so to explore. The port was fun too with LOTS of shops, restaurants/bars (even one with a pool), and a little chunk of beach to enjoy! And OH the color of the water there – beautiful!!! It was a great port day for us! 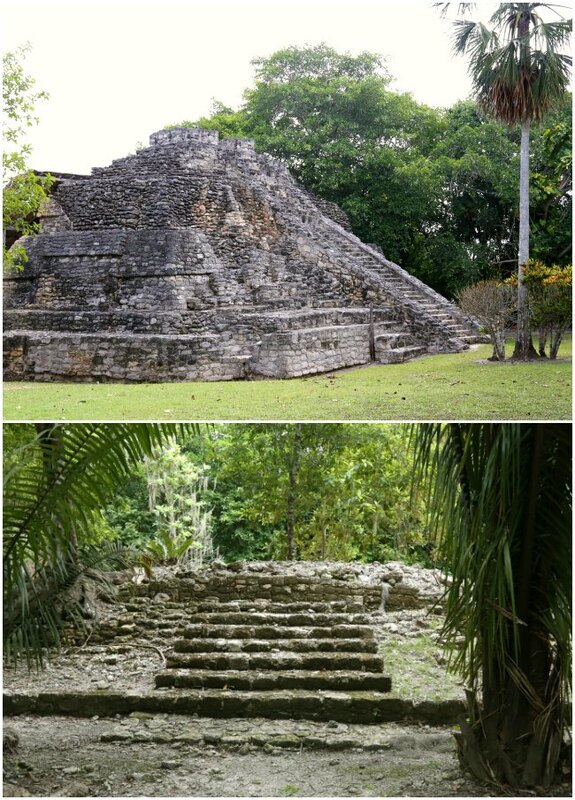 So, if you’re interested in a well-run shore excursion in Costa Maya that is educational (rich in history and culture), we highly recommend the Chacchoben Mayan Ruins trip! Our family LOVED it! Have YOU been to Chacchoben? What did you think? Disclosure: We were invited to participate in the #LetsGOCarnival retreat/press trip with SJ Consulting, sponsored by Carnival. As such, this shore excursion was provided by Carnival. As always, the opinions are entirely our own.